And check out OUR NEWLY LISTED ITEMS. This is the original art to the splash page for Crime Suspenstories #27, published by E. This is the first page from the story, and is a classic example by one of the greatest artists in the history of comics, the legendary "Ghastly" Graham Ingles. This is the title page Pg. 1 for the classic story "Good Boy", and is just an outstanding example by one of the most stylistically distinctive artists in the history of comics. This is large twice-up Golden Age era size artwork, and is just a beautiful and stunning display piece, made all the more so by the fact that it is historically noteworthy. It is the splash page for the last story from the last issue of one of the best-known titles from one of the greatest publishers of all-time. 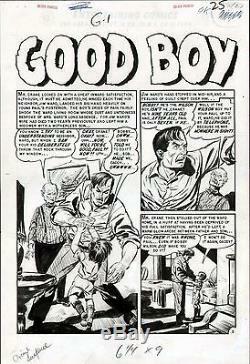 At twenty-seven issues, this legendary title featuring crime, shock, and mystery suspense stories had a run comparable with EC's classic horror comics such as Tales From The Crypt, The Haunt of Fear, and The Vault of Horror, and longer than the classic science-fiction titles Weird Science and Weird Fantasy. Ingels is one of the most respected and talented artists to ever work in comics, and was loved by both fans and artists alike. He was one of the all-time legends in comic art, and work of this quality, and from this era, rarely surfaces for sale, and once pieces go into collections they do not come out again. This is an exceptional and unbelievably rare piece of EC artwork, that would look fantastic framed and prominently displayed, and would be a true key piece in any collection. Check out our other auctions for more great items. Check it out, you'll be glad you did! The item "1955 EC COMICS GRAHAM INGELS CRIME SUSPENSTORIES #27 ORIGINAL ART SPLASH PAGE" is in sale since Monday, January 20, 2014. This item is in the category "Collectibles\Comics\Original Comic Art\Splash Pages". The seller is "satchj3" and is located in Brooklyn, New York. This item can be shipped to United States.